Getty Images/ Samir Bol / StringerAn internally displaced girl carries firewood in Ganyiel village of Panyijar County of Unity State on March 21, 2015. South Sudan’s inflation rate is officially the highest in the world. Headline inflation came in around 295% year-over-year in May, up from April’s 266% YoY, according to the South Sudan National Bureau of Statistics. And, in light of the South Sudanese pound’s sell-off and ongoing drought, inflation is likely to hover in the triple digits through the end of 2016. The combination of soaring “inflation and sluggish crude production will see the South Sudanese economy contract for a second year in 2016,” noted a BMI Research team in a report. “While the country will return to positive growth in 2017, structural obstacles, including continued political uncertainty and poor infrastructure, will undermine a rapid economic turn-around,” they added. 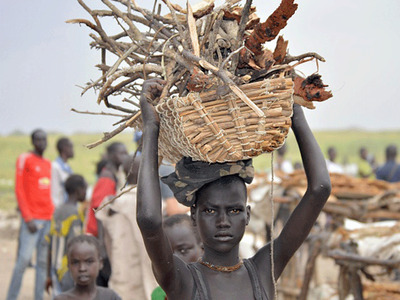 South Sudan gained independence from Sudan in the summer of 2011. But the fledgling nation sunk into a civil war in 2013 amid a power struggle between President Salva Kiir and his then-deputy Riek Machar. The ensuing conflict resulted in thousands killed and over 2.2 million displaced peoples, according to statistics from BBC. An internationally-mediated peace agreement was signed in August 2015, which was followed up with the formation of a unity government in the spring of 2016. However, while this all represents a step in the right direction to restoring peace, it’s not going to be a quick fix for any of the long-term structural issues. “Indeed, while the recent formation of a unity government represents a crucial step toward addressing the chaotic political environment, it is unlikely to fully address the challenging security environment in the country, keeping investors cautious and weighing on crude production,” the BMI team noted. “…violence persists, with sporadic reports of continued fighting between the SPLM-IO affiliated militia groups [the anti-government forces] and the government army. Moreover, the potential for a re-ignition of tensions between the two sides remains high. This suggests that any new investment into the country – either into the oil or non-oil sector – will be gradual,” they added.